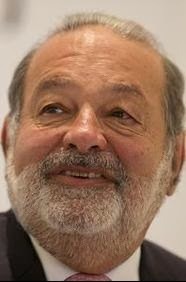 Carlos Slim Helu is the world's richest man for the fourth year in a row ($76 billion). He clocks in at $4 billion more than a year ago, thanks to surging stock prices at his financial arm, Grupo Financiero Inbursa, and at his Grupo Carso industrial and retail giant. Pan-Latin American mobile telecom outfit America Movil remains his most valuable holding at $36.3 billion; the company spread its wings to Europe in the past year, buying pieces of Dutch telecom company KPN and Telekom Austria. Other listed companies focus on mining, real estate and infrastructure. Slim does not hold an executive position at any of the companies he controls, but remains engaged and advises on strategy. He put his sons, Carlos, Marco Antonio and Patrick, in charge of the industrial, finance and telecom companies he controls.In September America Movil bought stakes in two Mexican professional soccer teams; in November Slim bought a majority of struggling Spanish soccer team Real Oviedo. Early 2013 saw a surge in Slim's philanthropic activity. The Carlos Slim Foundation pledged to translate into Spanish 1,000 videos from the Khan Academy education nonprofit website. Slim also hosted Bill Gates in late February; the two men announced they are funding research to improve farmers' yields and reduce hunger.